Counsel for the British government’s defence has admitted to ‘torture and other ill-treatment at the hands of the colonial government’. 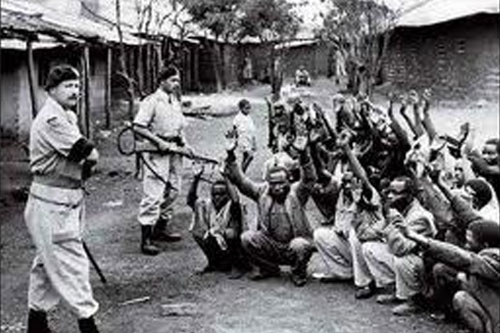 But, having lost an earlier High court action centred on the scandalous claim that the current Kenyan government, not the British State is legally responsible for these atrocities, the British government is now relying on a statute of limitations in such cases, even though it had hidden papers detailing these and other crimes for over 50 years and illegally destroyed others. The existence of a remaining cache of documents, a vast store of incriminating evidence, had for decades been denied by successive British governments, and only came to light because a representative of the British government baulked at having to repeat the lie under oath in last year’s court case. The three cases are characteristic of the effects of the British reign of terror against the national liberation struggle in Kenya. Wambugu Nyingi was a freedom fighter with the Mau Mau insurgents, and suffered torture. He argues that it was impossible to bring a case against the British government because the Mau Mau was a banned organisation in Kenya until 2003. Jane Mara had provided food and shelter to fighters, at considerable risk to herself and her family. She was illegally detained and brutally sexually assaulted under the direction of British officers. Paulo Nzili was incorrectly suspected of being a Mau Mau militant, and during his illegal detention was tortured and forcibly castrated. The official British line has long been that ‘only’ 12,000 fighters were killed and that there ‘were atrocities on all sides’. However, no-one disputes that only a tiny number of white European troops or the white colonial settlers died during the national liberation struggle, less than one hundred. More objective accounts put the numbers of Mau Mau killed an imprisoned far higher. Caroline Elkins’ Pullitzer Prize-winning, Britain’s Gulag, the brutal end of Empire in Kenya estimates that 1.5 million Kenyans were held in detention camps or ‘secure villages’ surrounded by barbed wire, fences and armed guards. This is equivalent to almost the entire Kikuyu population at that time, the mainspring of the rebellion. She also argues that somewhere between 100,000 and 300,000 Kenyans were killed by the Colonial administration and its allies. In a letter to The Times of July 20 former RAF pilot Michael Holmes speaks of 400 air strikes in the forests of the Aberdare Mountains and Mount Kenya against the entire population who were deemed to be Mau Mau supporters. In effect, Britain organised a successful counter-revolution on the land in Kenya, even as it was being forced to formally retreat from it. Mau Mau fighters were deprived of their land, and the British colonialists turned it over to colonial ‘loyalists’ who were willing to do their very dirty work. In this way they ensured the emergence of a tame government willing to trade with Britain and other Western powers on even the most unfavourable terms. That remains the case. Against all economic and geographic logic, Britain is still Kenya’s main export market. Kenya is also increasingly caught up in the military ambitions of US imperialism in the region, and is now no longer just a base for US military intervention in Somalia and Sudan but an active participant. Of course, British colonialism was never avowedly imperialist in ambition but instead was decorated with all forms of liberal phraseology. That has been modified in the current period to encompass all sorts of human rights and democratic-sounding phrases. Yet Britain’s participation in the modern interventions in Africa and the Arab world are no less pernicious than in the colonial era, despite the subsequent rebranding. This is the same British state that is now compounding a despicable legacy in Kenya with a shameful legal defence against compensation. The people of Kenya are owed far more than they are ever likely to receive from Britain, but a just settlement would be an admission of guilt and small token of justice for the three claimants and all those who are likely to follow any successful claim.